Monasterio de San Pedro Cláver. The temple is part of a set of religious buildings as the Cloister of San Pedro Cláver and the archaeological museum. It was built between 1580 and 1654. The body of Saint Peter Claver is located in its main altar. Siege of Cartagena de Indias of 1741 where Spanish Empire forces, of 2,800 men, commanded by Blas de Lezo defeated the British fleet and armies, of 23,600 soldiers, by Admiral Edward Vernon. The failed siege was decisive for the victory of the War of Jenkins' Ear in which the British wanted to take over various lands of Spanish America. The Torre del Reloj Público (Public Clock Tower) was the main entrance to the old city. Originally, the clock tower had only the central archway. The other two arches were added in the 18th century, and a new clock in the 19th century. A view of the both Colonial and traditional neighbourhood of Getsemaní, usually found old houses painted with graffiti. Gertrudis sculpture by Fernando Botero in Plaza de Santo Domingo square in the old town. 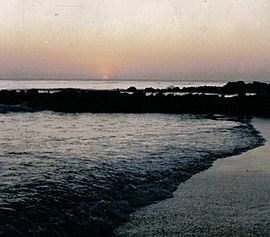 The Barú Island, joined to the city by the Puente de Barú bridge, has several beaches like the famous Playa Blanca, in the image. Islas Corales del Rosario, it is a small archipelago of some 28 islands facing the coast of Cartagena de Indias. In it is located one of the national parks of Colombia, created to protect one of the most important coral reefs of the Caribbean coast of Colombia. 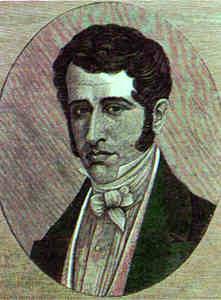 José Fernández de Madrid was one of the first playwrights of the New Granada and his personal library was one of the richest of his time born in Cartagena, the University of Cartagena named its library system in his memory. 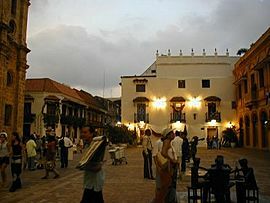 Museo Naval del Caribe, this naval museum housed in a colonial building of almost 3,500 square meters, located in the walled city of Cartagena de Indias, is divided into two large rooms: "Colonial area" and "Republican area". Castle of San Felipe de Barajas located on the Hill of San Lázaro and was built by the Spanish during the colonial era. Construction began in 1536 under the name of Castillo de San Lázaro, later expanded in 1657. 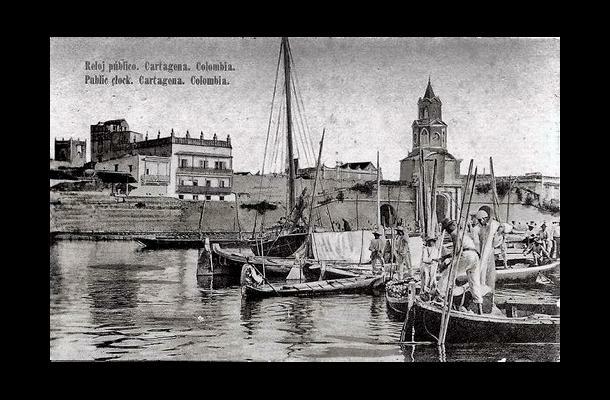 Cartagena de Indias Facts for Kids. Kiddle Encyclopedia.